Lt. Uhura is my first fan girl crush. Seeing her on Star Trek as a little girl, I was mesmerized by her glamour. Being swept up by the adventures of the Enterprise crew, I too wanted a fabulous life in space with flawless eyeliner and mini-skirts. character in Star Trek:TAS and the movies. 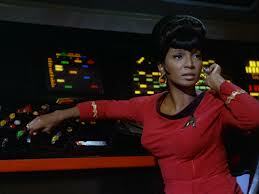 This entry was posted in Musings and tagged Lt. Uhura, Nichelle Nichols, Star Trek, Women in Sci Fi. Bookmark the permalink.